So I had some real trouble coming up with a book for this week. Sure, I had a couple books by a certain late author whose dinosaur books have been adapted into movies by Steven Spielberg in mind, but I figured there’s a good chance they’ll be used by many others this week, and I wanted to try and find something a little different. 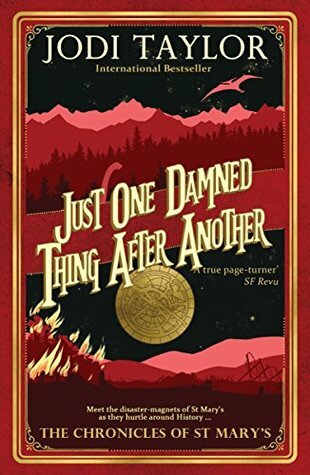 That said, the novel I ended up choosing was a surprise even to me, because even though I recall a section of the story that takes place in prehistoric times, I hadn’t expected it to have a cover that suits my needs. 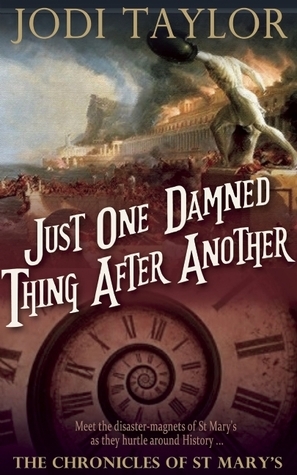 Just One Damned Thing After Another is a time travel story, starring a plucky historian named Madeleine “Max” Maxwell who gets recruited into a secret society of time travelers working undercover behind the façade of St. Mary’s Institute of Historical Research. The plot is very entertaining and filled with boisterous comedic hijinks, and one of the biggest perks of it was being able to absorb behind past events, people, and places. And like I said, the most exciting time period Max gets to visit will probably appeal more to dinosaur enthusiasts or paleontologists rather than history fans. So, without further ado, let’s take a look at the covers. You kind of have to look really closely on one of them, but sure enough, there are the dinosaurs! This book has an interesting history. Originally self-published by Jodi Taylor on two download websites, that manuscript ended up being bought by the UK publisher Accent Press before going on to become a bestselling sensation across the UK and US. 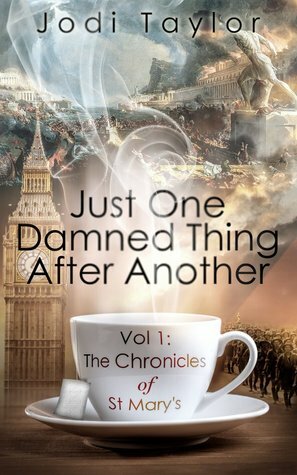 It’s not surprising therefore to see that the book’s first cover, the independently published Smashwords edition, is quite amateurish in its design. To be honest, the visuals actually aren’t that bad, but the atrocious typeface is what really reveals its self-pubbed roots. The 2016 Night Shade Book edition, which is the novel’s publisher in the US, uses some of the same original imagery on its cover, except it also cleans everything up and borrows the more attractive font from the UK version. The clear winner here for me, however, is the Accent Press edition. I love the colors and the art style used, and as a bonus, it’s also the one with the actual dinosaurs! So, that’s my choice this week. But what do you think? Which one is your favorite? ← Guest Post: “Real Phony” by K.R. Richardson + International Giveaway of Blood Orbit! Ooh I love this cover, with the dinosaurs on it- dinosaurs on a cover usually get me, and the cover design almost reminds me of those Barnes & Noble special editions that have a similar look. Good call. Just read this book last month. Enjoyed it. It’s a great book, and I keep meaning to continue with the series! It took me a minute but when I spotted them it made me laugh – great book choice – I think I’ve just recently bought this to start the series after reading glowing reviews. Oh yea I like that red cover too. I’ve heard some good things about this series and hope to read it one day (story of my life). Same story here, lol. I hope you get a chance to check it out. I keep meaning to continue with book two! Yeah, I did my best to find something else, anything else lol! It’s a pretty image for sure, I just hate the lettering! It’s very pretty, so I know where you’re coming from. The colors are great. I just hate the font, lol. Haha, this week, I would have taken anything! I think I like the Smashwords cover best, despite the awful font. I like the simplicity of the tea cup with the chaos in the background. It provides a cool contrast. Yes, the font is awful, isn’t it? LOL! A pity too because I agree with you about the image. The colors are wonderful. Yep, the clear winner there, especially since I love the color scheme. I think I prefer my horror creature feature books for dinosaur covers! Me too! I was going to go with a Meg cover if I really couldn’t find anything, but I didn’t want to go with a book I hadn’t read if I could help it. I didn’t know this involved dinosaurs!!! And wow I love the cover you choose!